Do you want to work at home and manage your own time but you find it hard to look for job opportunities online? Then apply now as a Remote Transcriber at TranscribeMe. This legit home-based opportunity lets you work part-time with flexible hours. All you need is a reliable computer, stable Internet connection, and a set of headphones. 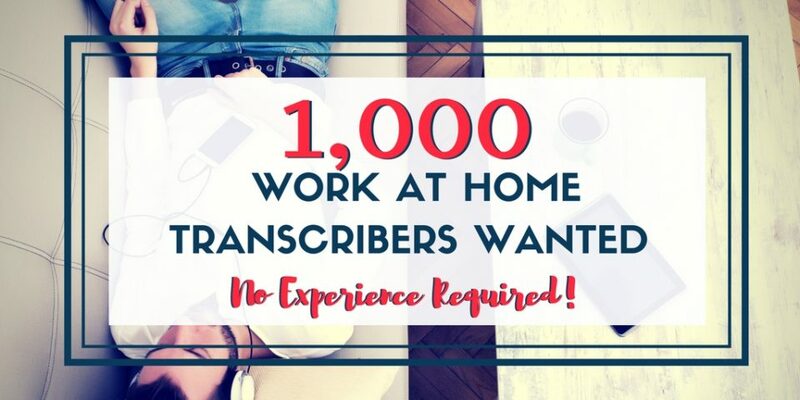 Learn more and apply at TranscribeMe today! Transcribers are responsible for completing various audio lengths within a reasonable timeframe. You must have the ability to transcribe multispeaker files and familiar with speaker IDs and timestamps. The company does not require pass experience, however, you are required to pass an exam. TranscribeMe is searching for qualified candidates worldwide who have the ability to follow and interpret the English language accurately. If you have decent typing skills, someone who can be relied on with the tasks, and comfortable with flexible schedule, then you are the right candidate TranscribeMe is looking for. The rate of pay starts at US $35 per audio hour with rates as high as US $55 per audio hour. Transcribers will have the option to work for home, whenever you want and how much you want. Payments are made securely via PayPal. Click here to apply for the Transcriber position at TranscribeMe. Fill out the online application form, then you’ll need to watch an explanation video. Once completed, you are now ready for the exam. This stage requires you to listen to an audio file, then transcribe it. Once you have successfully completed the exam, you are now ready to begin the job. Want To Learn More About Transcription? Head over to Transcribe Anywhere for a FREE transcription mini-course. This course was designed to help newbies learn exactly what transcription is and how to be successful working from anywhere. I was completely new to transcription just like you, and this course is one of the few I highly recommend—and best of all, it’s FREE! Sign up for the course and start learning today! Do you want to see more homebased job listing? Follow our Facebook page now for more updates. Good luck! Im sorry Lashay, I spelled your name wrong below. Hi! Yes I do 🙂 Transcribe Anywhere is one of the few transcription courses I trust. Feel free to take the free course to see if the information is helpful at no obligation. Honestly on this blog, I only share companies that I’ve personally used and feel to be beneficial to others.